I recently had a friend visiting from Korea, and one of the first things she requested food-wise was a good taco (which is hard to find over there). 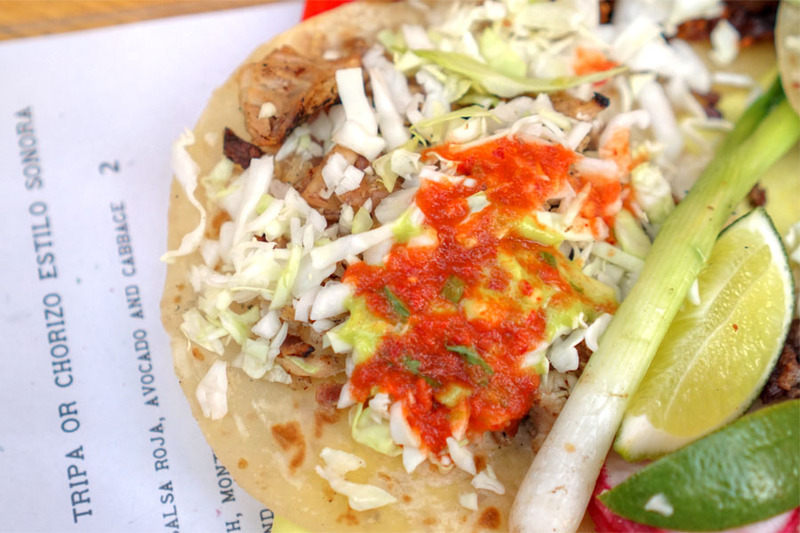 We decided upon Sonoratown, one of the more lauded taquerias to debut in recent times. 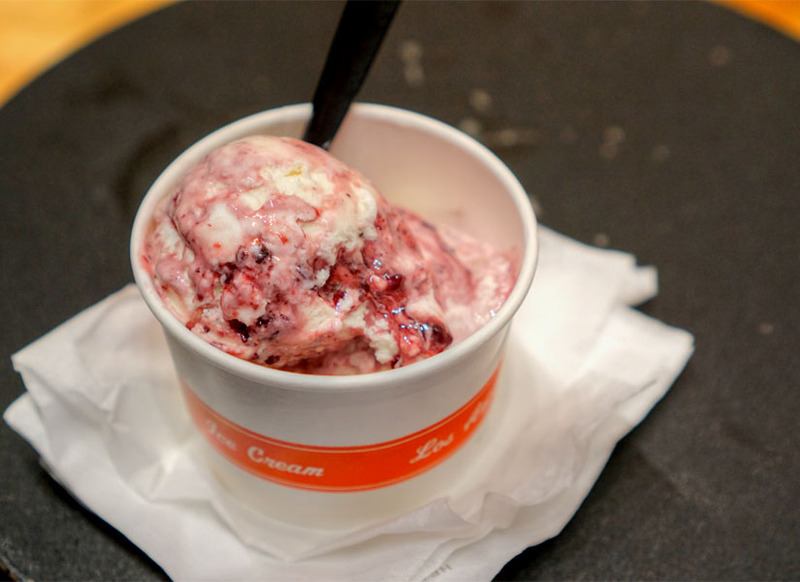 The spot opened at the start of June 2016, set in the former Fashion District home of Mexican eatery Toto's and froyo/sandwich/sushi purveyor Freli before that. It's the work of Chef Teodoro "Teo" Rodriguez-Diaz and his girlfriend Jennifer Feltham, two longtime Downtown denizens who apparently met while working at Bäco Mercat. 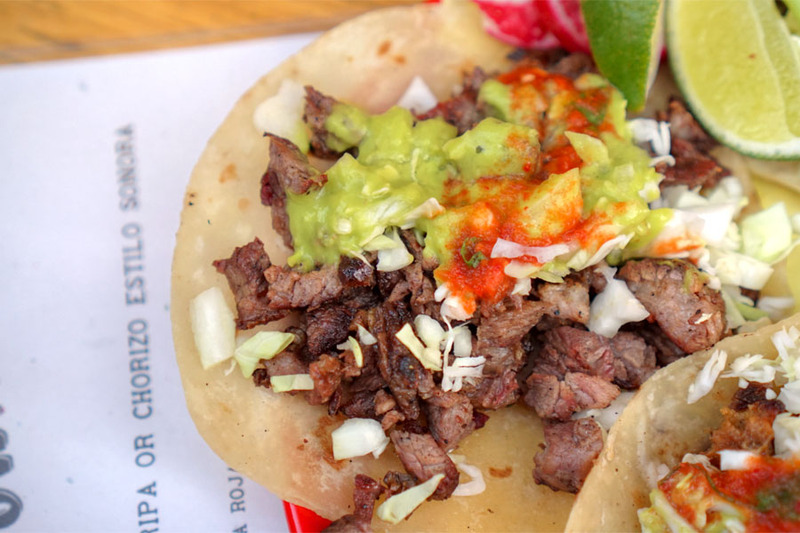 Named after a former LA neighborhood that was home to numerous Sonoran immigrants in the mid-1800s, the place specializes in tacos in the style of the Chef's hometown: San Luis Río Colorado in the state of Sonora. 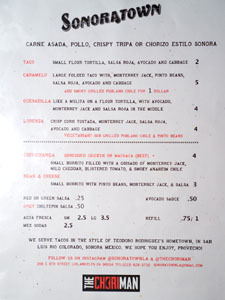 Sonora is known for its mesquite-grilled meat and flour tortillas, and that's exactly what the menu reflects. Just pick your protein and pick your format, basically. Click for a larger version. 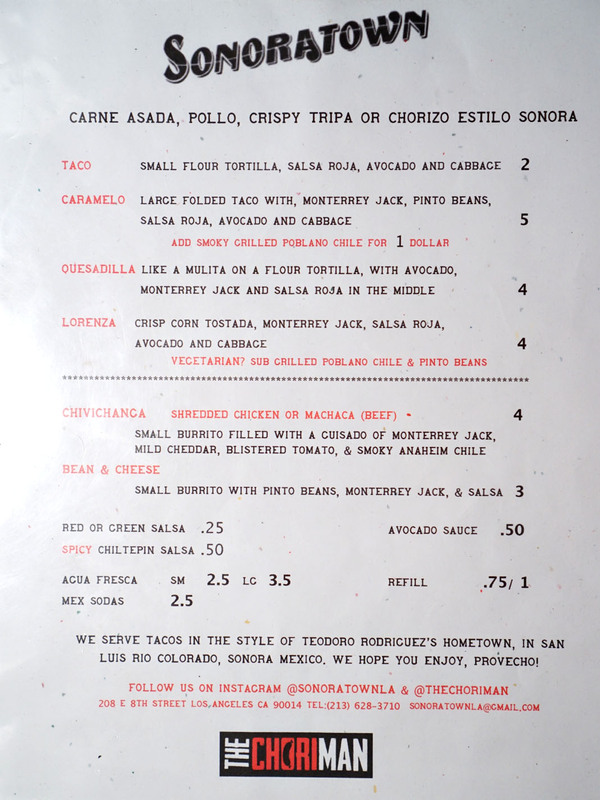 We had to begin with Sonoratown's signature asada. It's made from short rib, cut small and seasoned only with salt, then grilled over mesquite. The end result was pretty damn delish. What struck me the most was its smokiness, which was robust and omnipresent, but never domineering, and well-matched with the dish's various accompaniments. Texturally, the beef was tender, with just a smidge of crispy caramelization that I definitely appreciated. 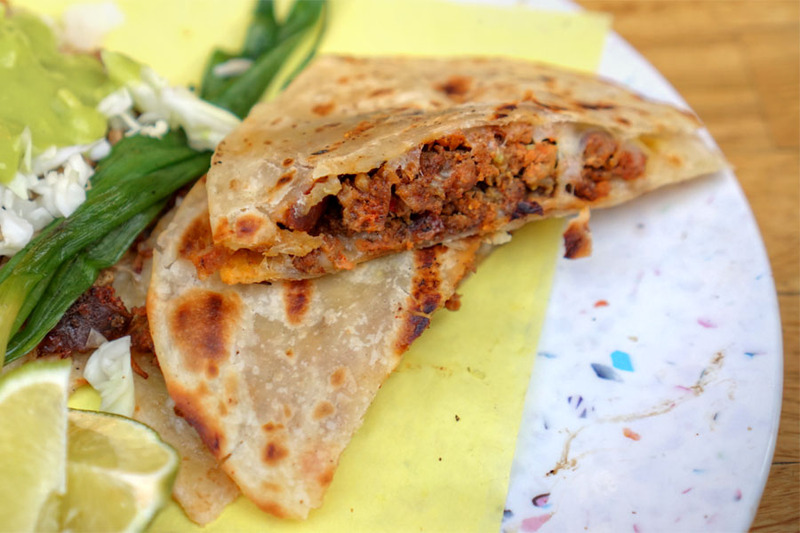 The tortilla is worth mentioning too, since it's far more finessed that your usual flour example, coming out thin--almost translucent actually--with a pleasant, stretchy chew to it. 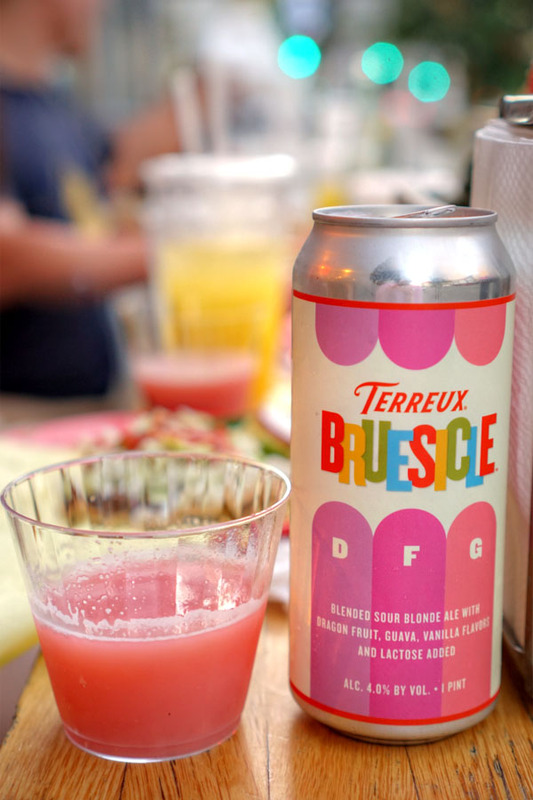 To go with our tacos, we opted for a can of the 2018 Bruery Terreux Bruesicle: DFG, a blend of foeder- and barrel-aged sour blonde ales with dragon fruit, white guava, vanilla, and lactose added. The beer smelled lovely, with appealing aromas of sweet-tart fruit commingled with a trace of vanilla. Its palate was thick, smooth, and showed off more juicy tropical fruit evened out by a tart, acidic backbone. The tripas were as crispy as advertised, while flavors were earthy, offal-y, and once again, delightfully smoky. Even better with a squirt of lime. Chorizo was provided by The Chori-Man (i.e. Humberto Raygoza of San Pedro), and did not disappoint. The crumbly, moist-but-not-greasy sausage showed off a palpable, pervasive heat, but also one that never got in the way. Yum. The chicken arrived well-textured, and was, not surprisingly, the least aggressive meat of the bunch, but still effectively conveyed the mesquite-fueled smoke of Diaz's grill. 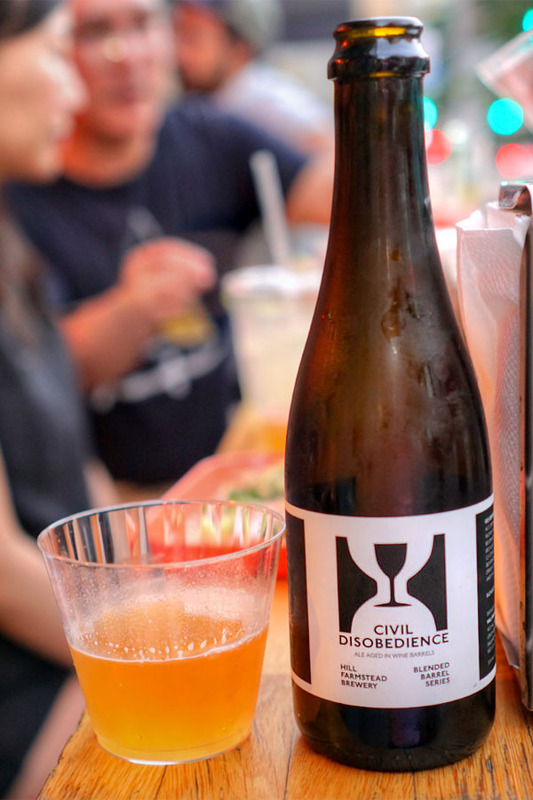 Next to drink was the 2015 Hill Farmstead Civil Disobedience #14, a blend of ales aged in wine barrels for 16 to 30 months. Beautiful bouquet featuring juicy stone fruit, flowers, and a funky, acetic underpinning. Taste-wise, I found the beer bright and perky, with citrus and more stone fruit joined by yeasty notes and oak in the background. One of my dining companions was actually reminded of drinking vinegar. Here was a gently-fried burrito of sorts, one of that was like a more finessed version of the frozen supermarket chimichangas from my childhood. The marriage of stewed meat and cheese--and there was a lot of cheese--was just spot on, and utterly comforting, with a touch of heat to boot. And given the heft of the dish, the tortilla actually served as a much appreciated contrast to it all. The lorenza was a winner as well. 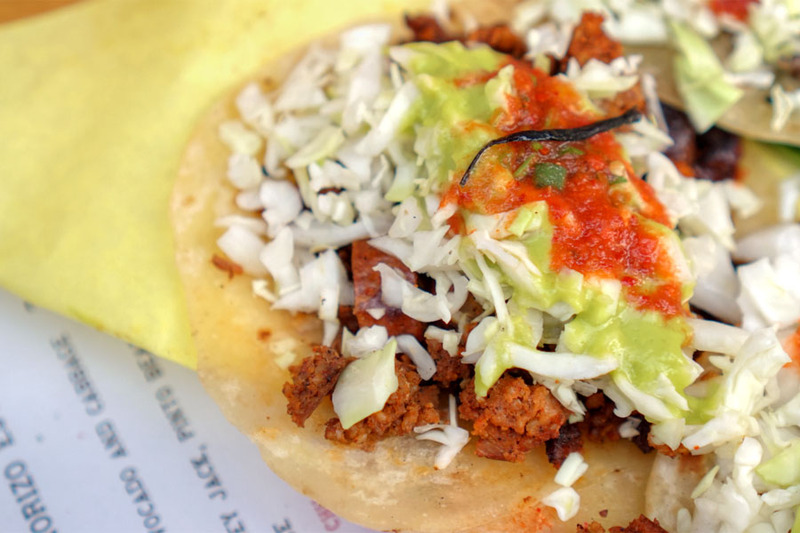 I was a big fan of how crispy the tostada was, which made the dish relatively easy to eat. Flavors, meanwhile, were pretty close to that of the tacos above. 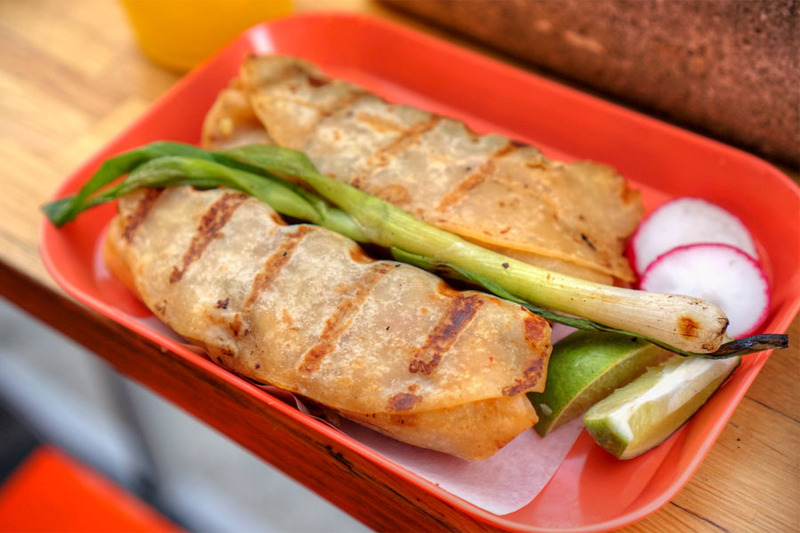 We ended with Sonoratown's take on the quesadilla, which was sort of like a taco-mulita hybrid. I enjoyed it as well, as it really highlighted the richly spicy, savory nature of the chorizo, while the cheese was a natural, delicious pairing. My friend from Korea was quite satisfied with her tacos, and I was as well. 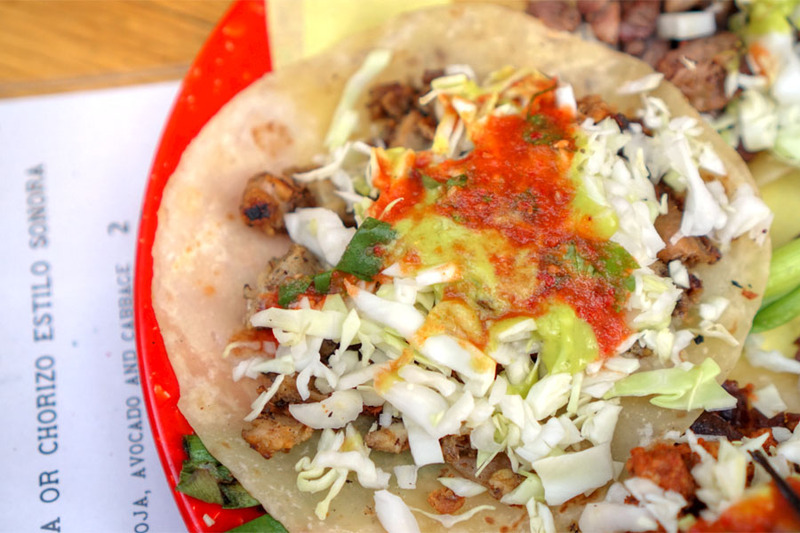 The food's Sonoran slant makes the place stand out for sure, and I can see why their asada taco was deemed the best in the City in 2017 by the folks over at L.A. Taco. 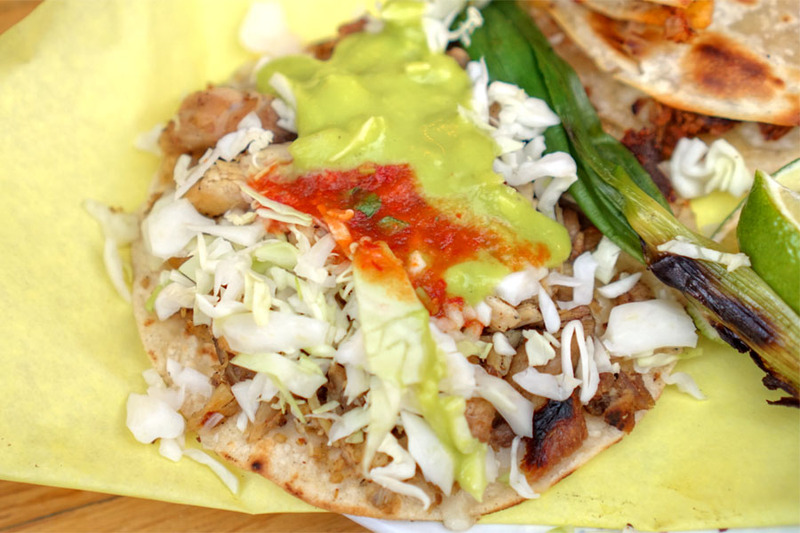 Los Angeles is a taco town no doubt, and Sonoratown looks to be one of our best. After dinner, we were in the mood for some dessert, and thus headed on over to Salt & Straw in the Arts District for some ice cream. 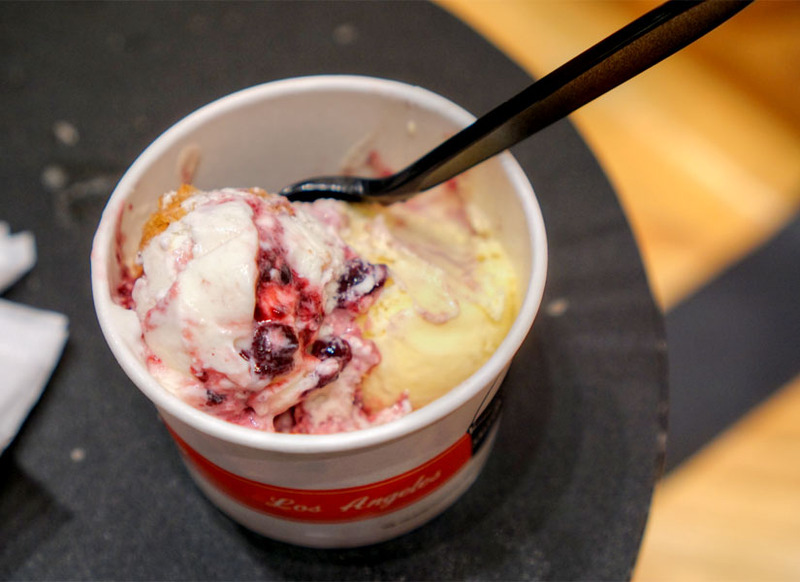 They were featuring a seasonal berry menu for the month of July, so we opted for servings of Birthday Cakes & Blackberries / Goat Cheese Marionberry Habanero as well as Dough & Co Peanut Butter Cookies & Wild Berry Jam / Meyer Lemon Buttermilk with Blueberries. You need to stop drinking these amazing beers with plastic glassware, it is an utter waste. Was it BYOB or did you pay a corkage (beer) fee?